Bringing ‘fun’ back to theatre: Bridget Minamore reviews Joe Wright’s extravagant and entertaining Life of Galileo. Life of Galileo at the Young Vic. Theatre, as much as I love it, is rarely the first artistic medium that comes to mind when I think of the word “fun”. Good theatre is frequently deemed as such by virtue of its dramatic restraint, and so more often than not the fun part of things is left by the wayside. Not so with Life of Galileo. At the Young Vic until July, the production is fundamentally a hell of a lot of fun. Taking John Willett’s translation of Brecht’s work, director Joe Wright takes the source material and runs with it. The end result? A theatrical spectacle that leaves his audience, his cast, and seemingly himself, all with smiles on their faces. The content of the production – as Galileo attempts to publish his findings on astronomy while avoiding the ire of the Catholic Church – is interesting enough, but often feels like more of a vehicle for the staging, set, and characters. At the core are questions about the social responsibility of scientists, alongside an exploration of different relationships: father and daughter, teacher and student, man and God. The text sometimes toes the line between powerful and cheesy but lines like “the truth only gets through if we force it through” and “truth is a moment of the present, not the past” sound sincere in context. Perhaps this is because of who is saying them: Brendan Cowell’s Galileo is excellent. 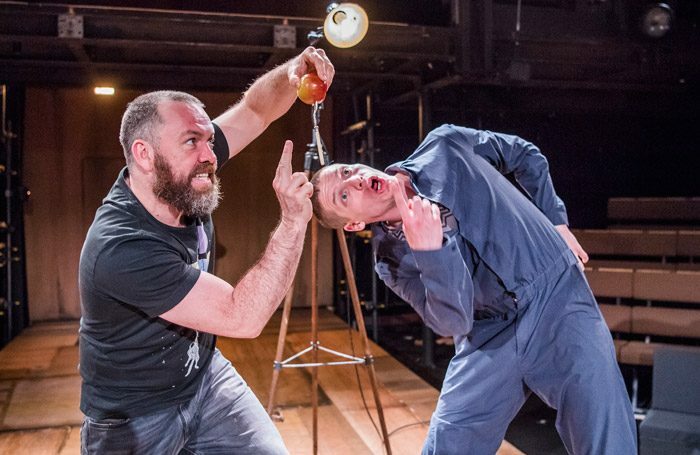 Sloping around the stage in scruffy jeans and a t-shirt (with a sweetly relevant design showing an astronaut holding a bunch of balloons), the Australian actor plays the astronomer as part mad scientist, part aging rock star Dad. We feel his child-like excitement, understand his flaws, and when he breaks the fourth wall (“Talk to Joe Wright if you have a problem with this bit”) it’s a real delight. The 10-piece ensemble around him is also perfectly cast (as well as happily diverse with regards to gender and race), and their frequent costume changes only add to the circus-like atmosphere that’s found throughout the play. Before it all begins, the cast were seemingly happily milling around the stage, waving and chatting to family and friends, and bobbing and weaving amongst the audience members making their way to the Stage Floor. While I’m sure this nonchalance was down to a mixture of Press Night delight and perhaps some pre-show direction, it nevertheless felt very welcome. Life of Galileo is very aware of its status as a piece of theatre, and the lack of pretention around this is perhaps its biggest weapon. When you’re mixing disco balls and a Chemical Brothers electronic soundtrack with the Vatican, it’s important to acknowledge the absurdity of it all, something the play does very, very well. The staging and set design are easily the most impressive aspects of the production. Making the most of the Young Vic’s dark corners and high ceiling, the Main Space is transformed into a planetarium-style arena. The audience is in the round but also in the middle, with the action taking place on a kind of boardwalk-esque platform between the internal and external audience members. The sheer size of the space gives the whole thing a (somewhat ironic, for a play set in the 17th century) futuristic feel. Look down and you can see the actors blending in with audience by sitting on the floor, but look up and you’re presented with what amounts to a giant screen on the ceiling that shows everything from mock-ups of Venetian church architecture, to the stunning oranges and reds seen when you look at the sun through a telescope. While the images sometimes distract, the highlights (like a blinking eye, birds in the sky or the stars at night) are captivating, and make a strong case for cinema-screen technology to be used in the theatre (sorry, purists). Ceiling screen aside, the use of props, costume and the set itself are also to be commended. While things start with a bang, there’s a shift after a (hilarious) point in the first act where the stage literally opens up and is bathed in light and choral music in truly Biblical fashion. At that point, I was slightly disappointed. It’s always fun to have an unexpected climax so early in a play, but we were less than an hour in – where to go from here? The answer, of course, was to leap across the line of self-indulgence. That sounds like a criticism, but it’s not; so often, restraint snuffs out excess in the theatre, and in a world where younger audiences associate theatre with words like ‘boring’, a bit of excess on occasion is welcome. Helpfully announced by Galileo himself alongside – what else? – puppets, every scene that follows takes the staging to a new and exciting place, as opposed to simply getting bigger each time. We learn about the way the sun is at the centre of the universe with an apple and a lamp, there’s a disco bathed in red light and a full-on circus freakshow. With a few exceptions (like the nearby Olivier at the National), spectacles of this nature are confined to musical theatre, pantomime, and children’s theatre. Like a lot of musical theatre, Life of Galileo’s excesses only wilt when it comes to how long it is – it could definitely have done with losing half an hour – but beyond that there are few complaints to be made. It might not be the dramatic emotional rollercoaster of other Young Vic productions like the soon-to-return Yerma, but it’s a play I could happily take any of my friends to, or the teenagers that I work with. Fun often feels like a dirty word in theatre, and I for one am glad the Young Vic, with Life of Galileo, is trying to bring it back. Life of Galileo is on at the Young Vic until 1st July 2017. Click here for more details.